This page will attempt to provide a historical analysis of the Democratic Party that Emile Bitar co-founded in 1969 and presided after his ministerial term. We will retrace the foundation of the party, its core beliefs, its achievements, and the reasons why the party freezed its activities at the beginning of the Lebanese War. 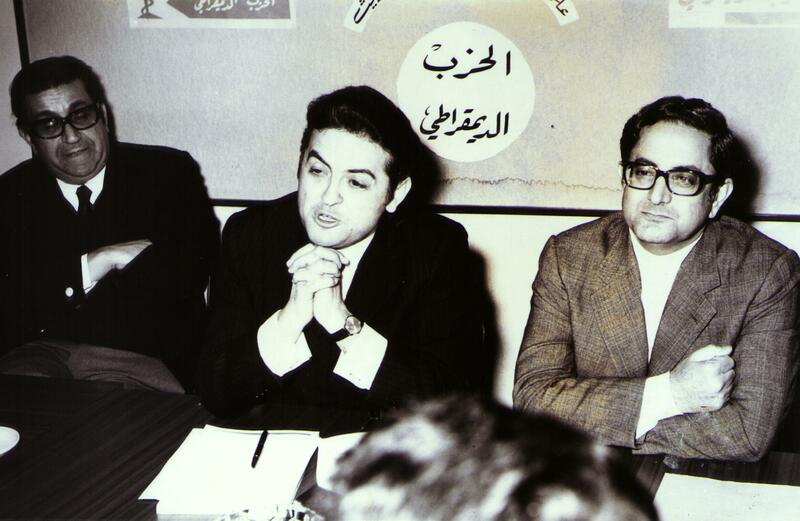 A unique experiment in Lebanese politics, the Democratic Party was one the first political organizations in Lebanon to bring together young professionals of all religious denominations, committed to modernizing Lebanon, promote economic development, social justice and human rights. Originally, most of its members belonged to the educated elite. However, after Emile Bitar's experience in government and the enthusiasm his actions created, the party attracted Lebanese from all walks of life. At the center of the political spectrum, the Democratic Party advocated national dialogue, fought against religious fanaticism and was instrumental in defending political reforms. The Democratic Party proposed the establishment of an optional civil marriage in Lebanon and submitted the project to Parliament through MP Auguste Bakhos. The party devised several comprehensive plans for health care issues, developmental and environmental concerns, for Women's Rights and the protection of the freedom of the press and civil liberties. When the war broke out in 1975, the members of the Party who lived in both East and West Beirut faced difficulties and were unable to organize reunions and continue their struggle serenely. Refusing to be used as a pawn by foreign powers, the Democratic Party put an end to its political activities. Emile Bitar and Bassem El Jisr published an anti-war manifesto which in retrospect appears rather prophetic. Members of the party pursued their struggle through different means. After the war ended, a founding member of the Party, lawyer and activist Joseph Moghaizel was appointed Minister of the Environment. Unfortunately, he passed away shortly after. Today, Bassem El Jisr is the Vice President of Nassib Lahoud's Democratic Renewal Movement. Issam Assi, Laure Moghaizel, Farouk Abillamah, Norma Melhem, Samia Khouzami, May Ziadé, Antoine Abi Nader, Joyce Ziade, George Khawwam, Maurice Diab, Ramez Salamé, Nidal Abou Habib, Nabil Boustany, Daoud El Sayegh, Hyam Mallat, Roland Bakhos, Mohammad Haydar Ahmad, Nazih Abi Assi, Nadim Boustany, Said Bitar, Antranik Badoyan, Mohammad Biazeid, Joseph Baroudi, Ramzi Tabri, Fouad Tabet, Habib Honeine, Yehia El Hakim, Emile Kanaan, Mounir Hamadé, Mounir Haddad, Roger Khayyat, Michel Boustany, Bassem Khalife, Jean Khoury, Mohammad Amin Daouk, Joseph Chaia, Joseph Chalouhi, Bahjat Daou, Ibrahim Traboulsi, Youssef Tohme, Afaf Attié, Rustom Aouad, Semaan Karam, Boulos Kanaan, Toufic Moawad, Said Lawand, Nagib Nakhoul, Maroun Labaki, Alfred Saadi, Antoine Mehanna, Georges Josephides, Lucien Beiruti, Fehmi Chaabane, Badri Hamade, Nabil Mehio, Habib Lteif, Albert Melki, Nicolas Moghaizel, Samir Hayek, Samir Kanaan, Amale Abou Rjeily, Abla Diab, Samir Jamal El Dine, Aphlatoum Hatoum, Raja Sari Eddine, Salim Dahhan, Ali Chehade, Ibrahim El Abdallah, Joseph Naffah, Ahmed Stetie, Fouad Cbeklou, Mahmoud Soueid, Emile Abi Zeid, Nicolas Kikano, Emile Bachir, Jean Kerillis, Ezzat Safi, Kheirallah Ghanem, Louis Cardahi, Abdel Aziz Kabbani, Michel Kyriakos, Ramzi Jreige, Yaacoub Khalife, Roger Azar, Alfred Kareh, Zaki Abou Taaam, Abel Rahman El Labban, Adnan Cheikha, Michel Assi, Mohammad El Halabi, Georges Corm.